Pluto's dark-red region might have been formed by a huge impact, according to new research. In 2015, scientists learned that there’s a giant red "whale" on Pluto. This dark-colored region could be the mark of a giant impact — the same one that produced Pluto’s huge moon Charon, according to a group of researchers in Japan. Thanks to that mission, we now know that Pluto has towering ice mountains, blue skies, a 620-mile-wide (1,000 kilometers) heart-shaped nitrogen glacier, jagged faults and, potentially, an underground ocean. One of the most prominent features on Pluto is the informally named Cthulhu Regio, also called "the whale," which stretches across 1,900 miles (3,000 km). Cthulhu Regio is pockmarked with craters, which suggests it is billions of years old — much older than the craterless, young "heart" it borders. Scientists have said the dark region's reddish coloring might come from tholins, which are complex hydrocarbons. To further investigate how the whale got its coloring, Yasuhito Sekine, an associate professor at the University of Tokyo, conducted heating experiments on organic molecules, like formaldehyde, that would have been present on the newly forming Pluto soon after the formation of the solar system. Sekine found that he could produce the same dark, reddish color after heating solutions above 122 degrees Fahrenheit (50 degrees Celsius) for several months. 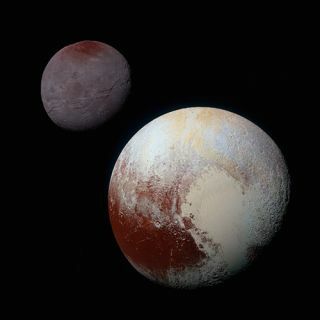 Meanwhile, Hidenori Genda, an associate professor at the Tokyo Institute of Technology, conducted computer simulations of a giant impact on Pluto. Genda found that the same impact that would have created Pluto's moon Charon, which is about half the size of Pluto, could have created a huge pool of hot water near Pluto's equator. And as this giant hot-water pool cooled, reddish complex organic materials would have formed, according to the findings, which were presented at the annual meeting of the European Geosciences Union in Vienna last month and were also published in the journal Nature Astronomy earlier this year. "For the terrestrial planets in our solar system, giant impacts are common," Genda told Space.com. "Our results suggest that giant impacts are common in [the] outer system beyond the Neptune orbit." The color changes across Pluto "make an interesting pattern, and we don't have good ideas to explain all of these features, so we are all still in the initial stages [of] exploring different hypotheses to explain these variations," said Kelsi Singer, a co-investigator on the New Horizons extended mission at the Southwest Research Institute in Colorado. But Singer, who wasn't involved in the new study, isn't entirely convinced by the newly described impact scenario. She told Space.com in an email that it is unlikely that the "whale" has remained mostly the same for the past 4 billion years or so, because the region has a lot of variation within it. The dotted lines show the dark region shaped like a whale in this image of Pluto taken by NASA's New Horizons spacecraft.